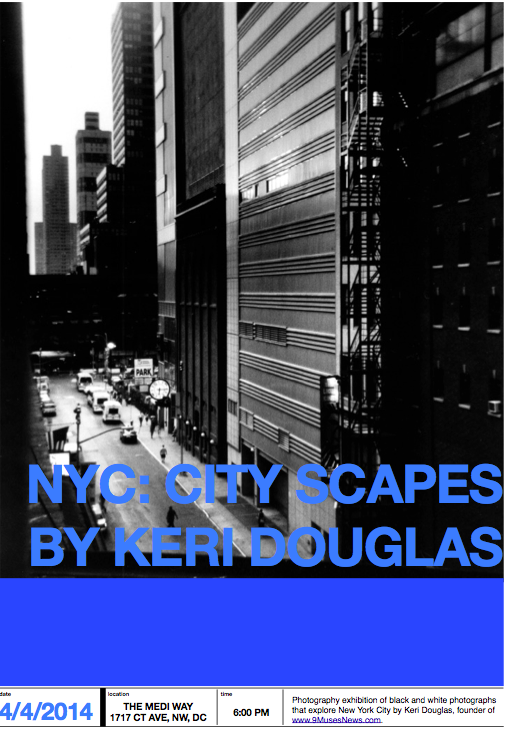 Photography exhibition of black and white photographs of New York City by Keri Douglas, founder of http://www.9MusesNews.com. The photographs in this exhibit are part of a series on Steele and Light capturing the gentle relationship between strength and air in the known and unknown. Join the First Friday Dupont Circle Gallery Walk at the Art Loft of The Mediterranean Way at 1717 Connecticut Avenue, NW, Washington, DC at 6 pm to 8 pm. Enjoy art and appreciate a new business in Washington, DC. Tags: City Scapes, Exhibit, Keri Douglas, NYC, Photography, Steele & Light, Steele and Light, The Medi Way, The Mediterranean Way. Bookmark the permalink. Great. =) I grew up in NYC. I love NYC, too. In between living in different countries growing up, NYC (and Bremerton/Seattle) was home base.